D.C. residents who use Airbnb or similar booking services to rent out their homes will likely have to abide by new regulations starting next October, when they are set to go into effect. The policies represent the first time the city has charted comprehensive laws for short-term rental units—an effort that has sparked a fierce debate spanning roughly the past two years. District lawmakers on Tuesday unanimously green-lit rules for short-term rentals, after they had delayed a final vote on the rules last month. The legislation bans property owners from renting out any homes other than their primary residences for fewer than 30 days at a time, commonly done through platforms such as Airbnb and VRBO. It also restricts to 90 the total number of days a year that a host may rent out their primary residence when they are away. But now the legislation also features a “hardship exemption” to the annual cap on so-called “vacation rentals” for hosts who can demonstrate that their jobs or family medical situations require them to leave the District for more than 90 days a year. Lawmakers who backed the exemption said it will provide flexibility to military members, diplomats, and other residents. The exemption was approved on a 9-4 vote, over objections by the bill’s main authors that it would make the law harder to enforce. “There’s a sympathy when you talk about when the host is deployed because of business or the host has a serious health condition, but I think this is a recipe for mischief,” said D.C. Council Chairman Phil Mendelson. “This will be a giant loophole.” Under the bill, the Department of Consumer and Regulatory Affairs (DCRA) would grant short-term rental licenses, track the units, and issue civil fines for illegal ones. Ward 6 Councilmember Charles Allen led the charge to include the exemption. He said the potential for abuse was low because homeowners seeking flexibility from the law would be required to submit notarizations from their employers or family medical providers to DCRA. (Self-employed homeowners would have to file signed affidavits.) If granted the exemption, homeowners could then host short-term rentals for however many days they must be gone. “[It’s] a big difference than just send[ing] an email saying ‘I’m out of town,’” Allen responded when asked by Ward 5 Councilmember Kenyan McDuffie, who introduced the original bill in January 2017, about self-employed residents. At-Large Councilmember Elissa Silverman said the exemption process had sufficient “guardrails” in place to render the amendment narrow. At Allen’s suggestion, the Council also tweaked the legislation to bar vacation-rental guests from using annual visitor-parking permits. Residents have complained that the permits are being used for commercial activity instead of personal guests, thus taking up parking spots. The measure now heads to Mayor Muriel Bowser for review. Bowser’s office has previously said she wants to ensure that in regulating short-term rental units, officials do not lock out residents from “emerging and profitable markets.” But the Council could override any veto. Homeowners would be allowed to rent out entire properties as well as carriage houses and basement units under the new rules. 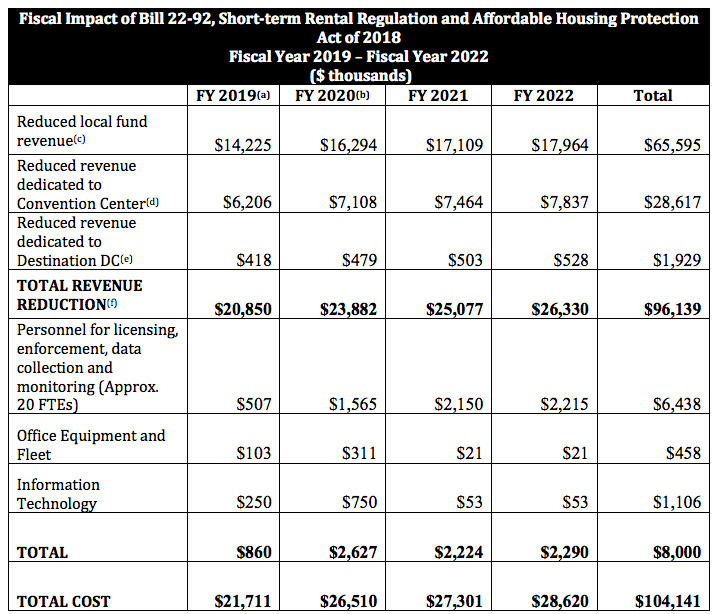 Still, because the current zoning code prohibits short-term rentals in residential zones—at least on paper—the District’s Chief Financial Officer has estimated that the bill will cost more than $20 million a year in lost tax revenue. That guess is based on the assumption that the current zoning statutes would actually be enforced once the bill becomes law. The D.C. Zoning Commission has said it will update its code to align with the Council’s action and permit short-term rentals where they are banned as of today. In a highly technical maneuver, Mendelson, the Council chairman, has proposed funding the new regulations with future budget appropriations and projected excess tax revenue. They will not take effect until Oct. 1, 2019, the beginning of the next fiscal year. “This will provide time for District residents who currently operate short-term rentals to shift the propert[ies] to another use,” Mendelson said on Tuesday. He said he was hopeful about the zoning issue. Short-term rental companies blasted the Council’s approval of the measure. In a statement, Airbnb called the vote “reckless,” saying it was “the latest example of the misleading tactics used to pass fiscally irresponsible home sharing policy.” “We remain committed to ensuring home sharing is protected in our nation’s capital,” the company said, mentioning the 6,500 hosts who use its platform in D.C. They will collectively lose $64 million a year, said Airbnb. Similarly, HomeAway, which is part of the same company as VRBO, said the bill “will harm thousands of local residents and small businesses as well as countless families looking to visit” D.C. “[We] will be exploring all of our options in light of today’s vote,” the firm noted. But members of the “It’s Time D.C.” coalition, a group that supports tighter regulations on short-term rental units, hailed the news. Graylin Presbury, a coalition member who is also the president of the D.C. Federation of Civic Associations, called the bill a “common-sense ordinance that protects true home sharing, while cracking down on commercial investors buying up residential homes to rent on Airbnb.” The latter has led to higher rents, he said. In the Council chambers on Tuesday, audience members from Unite Here Local 25, a hotel-workers union, clapped and cheered after the proposal was approved. John Boardman, the executive secretary-treasurer for the group, went up to the dais to shake Mendelson’s hand. The chairman obliged before politely shooing Boardman away and moving on to other bills.